A commodity? Sure. A resource, a tool? Yes, of course. But I have a still better word, one that while some will be offended by, is wholly appropriate nonetheless: slave. These stoories of surgery, air transport, drg therapy sadden me deeply. For some, those moments or hours in time mean nothing, just what we do. For horses – they are terrifying. Slave? Yes, that is the horrible reality. All of these contrivant modes of caring hold no warmth. Why didn’t they let him be? Why fly him here? Why subject him to surgery? He is now dead. A tortured being trying to be at peace and find balance with those arpund hm. Let them be. There are very mysterious circumstances surrounding his death. He went in for arthroscopic surgery which is a very common surgery in racehorses mainly used to remove bone chips from the knees or ankles. Bone chips are usually a result of both nutrition, and placing too much stress on underdeveloped bones. It is very rare to have a horse die during this routine surgery. Of course the racing industry has their secrets well hidden in that they insure that vet records are kept private, and the connections are Mum on any details. This horse more than likely had a hefty insurance policy based on his most recent earnings. Talco is just another death statistic in the business as usual horse racing world. The connections will probably use any insurance money to go out, and buy another one. A Disposable commodity is the racehorse, and Talco is no exception. Growing up in the industry and knowing it well. Basically it means that during the waking up process he was kicking around and probably kicked a a wall and shattered a leg. This not only a common procedure in racehorses, but in all sport horses. Ah yes…once again, they incriminate themselves. Oh please ………………. are you SERIOUS? Do you expect people to believe THAT? Alesia is right. I worked in a horse hospital for two years including the OR. Anesthesiologists are usually stationed above (not in) the recovery room to keep an eye on the horse when it wakes up, because that is the most dangerous time. Some breeds are more likely to thrash around upon waking and the Thoroughbred is one of them. It’s how Ruffian died. Those recovery rooms are very well padded so that the horses do not injure themselves in the waking up process. A “slave” he surely was! to go through certain veterinarian procedures to meet the conditions of the insurance policy. This may or may not have been the case here, however, it gives cause for query. 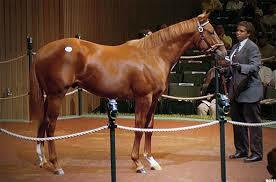 TALCO was a well bred colt and averaged $31,948 per start, he was valuable especially being an entire. The Breeders’ Cup fast approaching, they find something wrong with him after his last start on Sept. 27 at Santa Anita. According to the Chart TALCO “broke slowly” which, in my experience, often means that all is not well with the horse. Then he “lacked the needed late kick”. I believe that there was something wrong with him before he jumped out of the gates. They then do this and that to him to get him right, for what? PURE GREED! No Talco in the Breeders’ Cup and no Talco in the lucrative breeding barn. Exactly, and another dead statistic for this industry. Disgusting. I can’t stand it. I have Trainers whom I used to know attack me for my comments, and defend this horrific business. They use every attack in the book even saying that I should be ashamed to have been a Trainer, that they should never have licensed me. I guess not because I really cared, didn’t cheat or use massive amounts of dope, didn’t withhold hay while watching them pace, told it like I saw it, found homes for my horses, didn’t exhaust them for the almighty wagering buck. So yes, I guess that’s one thing they are correct on. I shouldn’t have been a Trainer because I didn’t uphold these things that are rampant in the industry. Carolyn, I see Shamrock Road finished last today, 24 1/4 off the winner. What is this Sexton doing ? The horse has started 6 times in 6 weeks. And, further, this is testimony to how racing and these track vets. are in collusion when it comes to horse abuse. DISGRACEFUL !! Thanks Rose – i’ve been away down in country Victoria, just got back, turned my computer on, straight to the emails and straight to Shamrock Road – not in the least bit surprised! I was offline while away and on the plane i just couldn’t get him off my mind, not knowing how he went. Tomorrow i will be having something to say – tonight i would like to say something but it is unprintable!